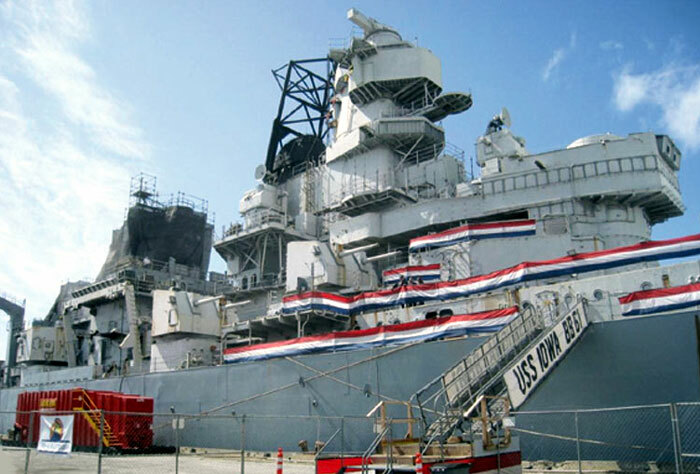 SAN PEDRO — In recognition of Veterans Day, a Veterans Appreciation Festival is scheduled in front of the new USS Iowa battleship museum at Berth 87 in the Port of Los Angeles. The event, hosted by Los Angeles Mayor Antonio Villaraigosa and City Councilman Joe Buscaino, in association with the Port of Los Angeles and USS Iowa, is scheduled from 1-4 p.m. Nov. 10 and will be free to the public. The celebration will take place on the grounds of the battleship museum, which opened in July. Veterans and their families will be allowed to tour USS Iowa at no charge. The festival will feature a presentation of the colors by California State Military Reserve Color Guard, a children’s play zone, patriotic Harley-Davidson motorcycle riders, free food, resource booths for veterans and live music from bands including The Swing of Things, Rock for Vets and the Riptides. The ship is located along the San Pedro waterfront at 250 S. Harbor Blvd. Parking is available on site for $1 per hour. Free off-site parking and a shuttle service is available at 22nd Street and Sampson Way in San Pedro. Known as the “Battleship of the Presidents,” USS Iowa was commissioned in 1943. The namesake of the Iowa class of battleships took part in every major military conflict from World War II until the post-Cold War period. It was decommissioned in 1990. Nicknamed “The Big Stick,” the 887-foot vessel was once called the greatest naval ship of its era, thanks to its big guns, heavy armor, speed, longevity and advanced technology. Over the course of its many tours, USS Iowa was host to more U.S. presidents than any other battleship. Its operations included taking President Franklin Delano Roosevelt to Tehran in 1943 for a secret meeting with Winston Churchill and Joseph Stalin. More than four decades later, President Ronald Reagan and first lady Nancy Reagan boarded the ship to celebrate the restoration and centenary of the Statue of Liberty in New York Harbor on July 4, 1986. Earlier this year, the Pacific Battleship Center, the group in charge of the ship and the implementation of the museum along Los Angeles Harbor’s waterfront, successfully towed the vessel under Golden Gate Bridge, down the California coast and into the harbor.